Thought I'd travel back in time today and feature another one of my favorite cop shows from yesteryear. Hawaii Five-O was a fun show, although I don't remember enjoying it quite as much as Mannix or The Man From Uncle. However, it was truly a show with staying power! I didn't realize how long it aired until I looked it up to prepare this post. Hawaii Five-O aired from 1968 to 1980, twelve years! A new version of the show aired in 2010 and ran for three seasons. I watched one episode for about five minutes. To me, the new version just couldn't compare with the original. 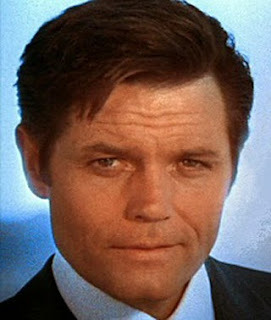 Jack Lord portrayed Detective Lieutenant Steve McGarrett, the head of a special state police task force which was based on an actual unit that existed under martial law in the 1940s. Danny Williams and became McGarrett's catchphrase, "Book 'em, Danno." 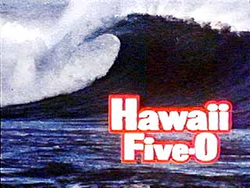 The Five-O team consisted of three to five members...and was portrayed as occupying a suite of offices in the Iolani Palace... Five-O lacked its own radio network, necessitating frequent requests by McGarrett to the Honolulu Police Department dispatchers, "Patch me through to Danno." McGarrett's tousled yet immaculate hairstyle, as well as his proclivity for wearing a dark suit and tie on all possible occasions...rapidly entered popular culture. While the other members of Five-O also "dressed mainland" much of the time, they also often wore local styles, such as the ubiquitous "Aloha shirt." In many episodes...McGarrett was drawn into the world of international espionage and national intelligence. McGarrett's nemesis was a rogue intelligence officer of the People's Republic of China named Wo Fat. The Communist rogue agent was played by veteran actor Khigh Dheigh. The show's final episode in 1980 was titled "Woe to Wo Fat," in which McGarrett finally saw his foe Wo go to jail. This television show's action and straightforward story-telling left little time for personal stories involving wives or girlfriends... Occasionally, a show would flash back to McGarrett's younger years or to a romantic figure. The viewer was left with the impression that McGarrett, at that point in his life...was wedded to the police force and to crime-fighting. Do you remember the original Hawaii Five-O? Thanks for visiting and have a great week! This is one of my favorite meals and a hit with the entire family, including my picky kids! 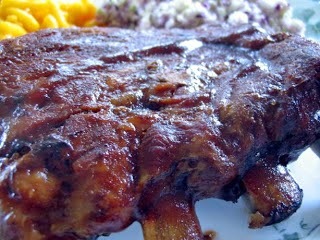 Season ribs with your favorite rib rub (I use this fantastic Kansas City Rub), grill seasoning, or just salt and pepper. Place ribs meat side down in baking dish (I buy a huge aluminum pans for this). Cover dish with aluminum foil and place in oven. If using small baby back ribs, take out of oven after 3.5 hours. If using regular baby back or St. Louis style, take out after 4. I guess I can't help being nostalgic these days. Last week I featured The Man From Uncle, and this week, Mannix! I loved this P.I. 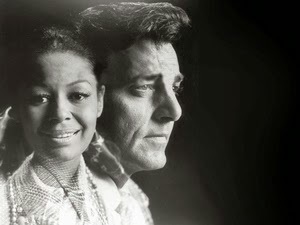 series that starred Mike Conners as private investigator Joe Mannix, and Gail Fisher, who played his trusty secretary Peggy Fair. Gail Fisher was one of the first black women to have a substantive part in an American TV series, and for her role in Mannix, she won two Golden Globe Awards and an Emmy Award. Mannix aired from 1967-1975, and perhaps one of the reasons I enjoyed watching it was because of Gail Fisher. I was just a kid back then, and there weren't too many women who looked like me on television. 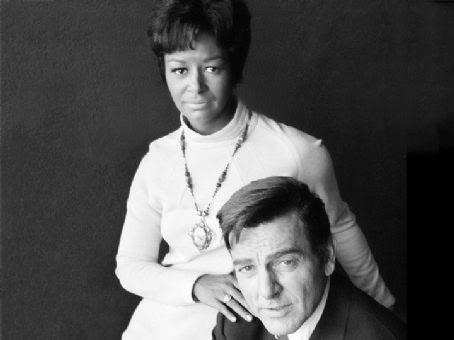 Mannix worked on his own with the assistance of his loyal secretary Peggy Fair, a police officer's widow played by Gail Fisher. He also has assistance from the L.A. police department, the two most prominent officers being Lieutenant Art Malcolm (portrayed by Ward Wood) and Lieutenant Adam Tobias (portrayed by Robert Reed). Other police contacts were Lieutenant George Kramer (Larry Linville), who had been the partner of Peggy's late husband, and Lieutenant Dan Ives (Jack Ging). While Mannix was not generally known as a show that explored socially relevant topics, several episodes had topical themes, starting in Season Two. In Season Two alone, there were episodes featuring compulsive gambling, deaf and blind characters that were instrumental in solving cases in spite of their physical limitations, and episodes that focused on racism against blacks and Hispanics. Season Six had an episode focusing on the effects the Vietnam War had on returning veterans, including the effects of PTSD. Joseph R. "Joe" Mannix is a regular guy, without pretense, who has a store of proverbs to rely upon in conversation. What demons he has mostly come from having fought in the U.S. Army during the Korean War, where he was initially listed as MIA while he was a prisoner of war in a brutal POW camp until he escaped. Unfortunately, over the length of the series, a sizable percentage of his old Army comrades turn out to have homicidal impulses against him, as did his fellow running back from his college football days. During the series, it is also revealed that Mannix worked as a mercenary in Latin America. Like the actor who plays him, Mannix is of Armenian descent. Mannix was shown to speak fluent Armenian during the series, as well as conversational Spanish. Mannix is notable for taking a lot of physical punishment. During the course of the series he is shot and wounded over a dozen separate times, or is knocked unconscious around 55 times. Mannix frequently took brutal beatings to the abdomen; some of these went on quite a long time, particularly by the television standards of the era. Whenever Mannix gets into one of his convertibles he can expect to be shot at from another car, run off the road by another car, or find his vehicle sabotaged. Nevertheless he keeps his cool and perseveres until his antagonists are brought down. The excitement was non-stop! Did you watch Mannix and enjoy it as much as I did? The Man from U.N.C.L.E. was one of my favorite TV shows when I was a kid. As a six-year-old , I had a desperate crush on blond spy David McCallum, who played Russian Illya Kuryakin, to Robert Vaughn's American Napoleon Solo. The series centered on a two-man troubleshooting team working for U.N.C.L.E. (United Network Command for Law and Enforcement): American Napoleon Solo, and Georgian (Georgia-USSR) Illya Kuryakin. U.N.C.L.E. 's adversary was T.H.R.U.S.H.... The original series never divulged what T.H.R.U.S.H. represented, but in several U.N.C.L.E. novels by David McDaniel, it is the Technological Hierarchy for the Removal of Undesirables and the Subjugation of Humanity, described as founded by Col. Sebastian Moran after the death of Professor Moriarty at the Reichenbach Falls in the Sherlock Holmes story, "The Final Problem." T.H.R.U.S.H. 's aim was to conquer the world. Napoleon Solo said, in "The Green Opal Affair", "T.H.R.U.S.H. believes in the two-party system — the masters and the slaves," and in the pilot episode ("The Vulcan Affair"), T.H.R.U.S.H. "kills people the way people kill flies — a reflex action — a flick of the wrist." So dangerous was T.H.R.U.S.H. that governments — even those ideologically opposed, such as the United States and the Soviet Union — had cooperated in forming and operating the U.N.C.L.E. organization. Similarly, when Solo and Kuryakin held opposing political views, the friction between them in the story was held to a minimum. The show was quite fun to watch with all the espionage and intrigue! And there was just enough humor to lighten the mood. I recently saw that a new movie is coming out this summer based on the series. I'll see it, but I hope it's as entertaining as the original! 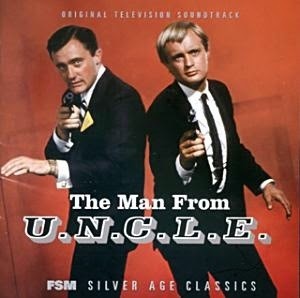 Were you a fan of The Man from U.N.C.L.E. ?